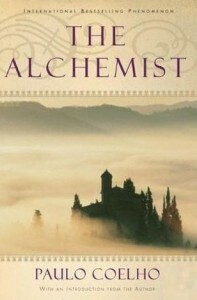 The Alchemist by Paulo Coelho is a little book rich in inspiration and in hope. Mr. Coelho says he wrote it from his soul, and that it is his metaphor for living life. I would say that Mr. Coelho is a very hopeful person. Though it tells a story, The Alchemist is written as parable, or rather, as a metaphor. That metaphor is that life is this boy's journey in search of a hidden treasure. In the telling, the author presents many truisms and wise words through the voices of his characters and through their actions. He does this very well and it is like reading an extended version of your favorite teaching stories from Plato or from the Bible, or even an extensive work like Don Quixote. The reader should understand this before delving into the book. Though Mr. Coelho tells his tale in a way that is more relate-able for modern readers than the older works I mentioned, it is not written as a contemporary novel. It is not a George Martin or John Grisham or James Patterson story. I think this makes it a disappointment for some readers, but I consider it to be the book's great strength. The storyline is that of the shepherd boy, Santiago, who became a shepherd because he likes to travel. Being young (late teens apparently, though we're never told his age) he still appreciates the mystery of life and the beauty of the natural world. He is prompted by a dream he has in a sacred place to seek a treasure buried somewhere in the vicinity of the Egyptian pyramids. He is seized by this dream and believes in it as an omen. He sets out to find the treasure. Santiago's quest is his "Personal Legend," which he learns is an alchemical term for "what you have always wanted to accomplish." And more, it is a consuming desire beyond the mere acquisition of stuff or position. But realizing what your Personal Legend is, is not the hard part, it is pursuing it. ...when you really want something, it's because that desire originated in the soul of the universe. It's your mission on earth...And, when you want something, all the universe conspires in helping you to achieve it. Santiago seeks verification for his dream-inspired quest and finds it in the words of a fortune teller. So now he is seeking his treasure in earnest and finds help from several persons along the way. Each of these characters represent aspects of following our Personal Legend and provide their lesson to Santiago. The first helper is Melchizedek, the King of Salem from the Bible. Melchizedek represents opportunity that requires a price. He always appears to the seeker, though not always as a person. He could simply be "a solution, or a good idea." I liked the way Mr. Coelho presented Melchizedek. I think I've met him a time or two in my life, though I fear I have not been very receptive to him. Later, Santiago encounters the crystal merchant. He is opportunity lost or ignored. He is remaining with familiarity and the distress felt from the realization of lost opportunity. He tells us that we are most regretful about those things we didn't do. Then Santiago meets a fellow seeker who is an Englishman. This man has a thorough "book knowledge" of alchemy and is seeking a master to fill out his knowledge and teach him the operational side of the craft. He is the scientific seeker. He has much knowledge, but he needs heart to get further. "It's a man who understands nature and the world..."
The Alchemist has found his treasure. Now he seeks disciples to teach. He has given the Englishman a task to help him along, and he takes a more personal involvement with Santiago. He intends to help the boy find his treasure. This help involves crossing the Sahara with a caravan and facing tribal war and bandits. In telling Santiago's story, Mr. Coelho does not make the way easy for him. This is a metaphor for living life and so he presents Santiago's uncertainties, mistakes, and hardships. Like Don Quixote, he takes a bashing several times. He also loses all he has gained (materially speaking, that is, his money) three times. So it is clear that monetary wealth is not the standard for judging success in following your Personal Legend. I read the 25th anniversary edition of The Alchemist which is illustrated with drawings that struck me as having a 19th century flavor that I found appealing. They were sparse in number and complimented the text. I read The Alchemist twice before writing this review, and I expect I'll read it again and refer to it from time-to-time. It is a book that encourages thoughtful consideration long after the covers are closed. It is one of my favorite reads and a significant guidepost for anyone seeking to follow their Personal Legend.